Tyl604 asked the Answer Line forum what the Cobian Backup installation program means when it asks for a domain name and password. That option can be a little confusing. To most people, a domain name is a place on the Internet, like pcworld.com. But in this case, Cobian is talking about your private, local network. Cobian can be installed as a service, which allows you to backup one computer to another over a network. Or it can be installed as an application, which is strictly a single-computer affair. The domain name and password are for network use. If you only want to back up your own PC to an external drive, you don't have to worry about any of this. 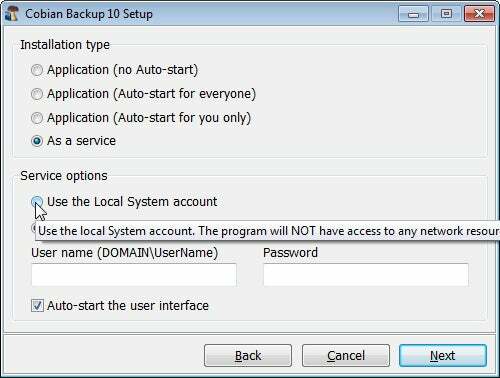 When installing the program, select Use the local System account. This grays out those confusing fields.